ABAP Basic list is typical classical report, the report is displayed on the screen using WRITE statement within the internal table loop. Classical Report Interactive by adding ABAP Event AT LINE-SELECTION and AT USER-COMMAND, typically interactive report are designed that display summarized information/ header data on the basic list and the user can click on row of line data to display more detail information report list. To pass identify the line that use selected and pass into subsequent processing block you can use HIDE statement. the HIDE statement is used to store the selected record in the hide area. Please check ABAP Code below for ABAP Basic list with Interactive. You can write information for header report in TOP-OF-PAGE event, for this sample we will put title of report into it. *&---------------------------------------------------------------------* *& Report ZBASIC *&---------------------------------------------------------------------* *& *&---------------------------------------------------------------------* REPORT zbasic. TYPES : BEGIN OF ty_vbrk, vbeln TYPE vbeln_vf, netwr TYPE netwr, kunrg TYPE kunrg, END OF ty_vbrk. TYPES : BEGIN OF ty_vbrp, vbeln TYPE vbeln_vf, posnr TYPE posnr_vf, arktx TYPE arktx, fkimg TYPE fkimg, vrkme TYPE vrkme, netwr TYPE netwr_fp, matnr TYPE matnr, mwsbp TYPE mwsbp, END OF ty_vbrp. DATA : gi_vbrk TYPE TABLE OF ty_vbrk, gw_vbrk TYPE ty_vbrk, gi_vbrp TYPE TABLE OF ty_vbrp, gw_vbrp TYPE ty_vbrp. PARAMETERS : p_row TYPE sy-tabix. START-OF-SELECTION. SELECT vbeln netwr kunrg INTO TABLE gi_vbrk FROM vbrk UP TO p_row ROWS. END-OF-SELECTION. LOOP AT gi_vbrk INTO gw_vbrk. AT FIRST. FORMAT COLOR COL_HEADING. WRITE : 5 'BILLING DOCUMENT', 50 'NET VALUE', 30 'PAYER'. FORMAT COLOR OFF. ENDAT. WRITE : /5 gw_vbrk-vbeln, 50 gw_vbrk-netwr RIGHT-JUSTIFIED, 30 gw_vbrk-kunrg. HIDE : gw_vbrk-vbeln. ENDLOOP. FORMAT COLOR OFF. AT LINE-SELECTION. SELECT vbeln posnr arktx fkimg vrkme netwr matnr mwsbp INTO TABLE gi_vbrp FROM vbrp WHERE vbeln EQ gw_vbrk-vbeln. LOOP AT gi_vbrp INTO gw_vbrp. AT FIRST. FORMAT COLOR COL_HEADING. WRITE AT : /5 'ITEM', 20 'DESCRIPTION', 56 'QTY', 75 'UOM', 96 'NET VALUE', 115 'MATERIAL', 130 'TAX AMT'. FORMAT COLOR OFF. ENDAT. FORMAT COLOR COL_NORMAL. WRITE : /5 gw_vbrp-posnr, 20 gw_vbrp-arktx, 55 gw_vbrp-fkimg, 75 gw_vbrp-vrkme, 85 gw_vbrp-netwr, 115 gw_vbrp-matnr, 130 gw_vbrp-mwsbp RIGHT-JUSTIFIED. FORMAT COLOR OFF. ENDLOOP. TOP-OF-PAGE. WRITE : 'Billing Doc Header Data'. TOP-OF-PAGE DURING LINE-SELECTION. WRITE : 'Billing Item Data'. PARAMETERS : p_row TYPE sy-tabix. SELECT vbeln netwr kunrg INTO TABLE gi_vbrk FROM vbrk UP TO p_row ROWS. LOOP AT gi_vbrk INTO gw_vbrk. LOOP AT gi_vbrp INTO gw_vbrp. WRITE : 'Billing Doc Header Data'. WRITE : 'Billing Item Data'. 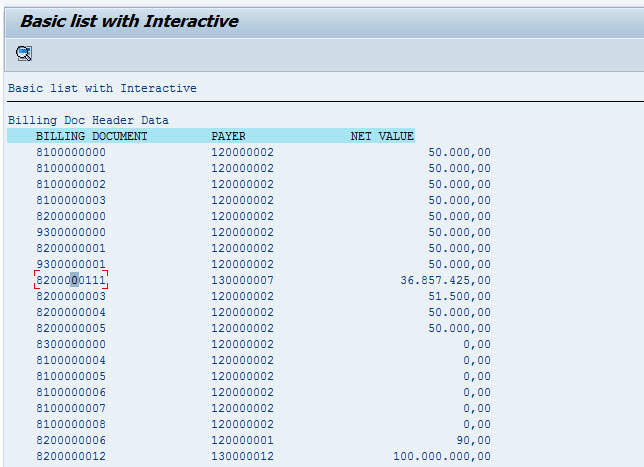 After user double click on Billing Document No, the detail list contain billing item data will be displayed.